An applicator (30) for applying or delivering a substance into a body cavity includes a deformable reservoir (12) for receiving and expelling the substance. The reservoir (12) has an inlet (20) spaced from an outlet, the inlet (20) being configured to be connected to a container containing the substance. Valve means (14) is positioned in the inlet (20) to inhibit flow of the substance into the body cavity is in flow communication with the reservoir (12) through the outlet of the reservoir (12). The new Gentle Comfort vaginal cream applicator is unique. It is easier to use, more comfortable to use and safer for women to use than the standard type applicator is. US patent no. US 6,537,260 B1 and US Design Patent no. US D457,627 S are for sale, or available to be licensed with a royalties agreement. This device is patented in Great Britain also. The market potential is enormous. Until now, the standard syringe type vaginal cream applicator has been the only type of applicator available in ordinary clinical practice. This new applicator is of great benefit to women. See Link for details. 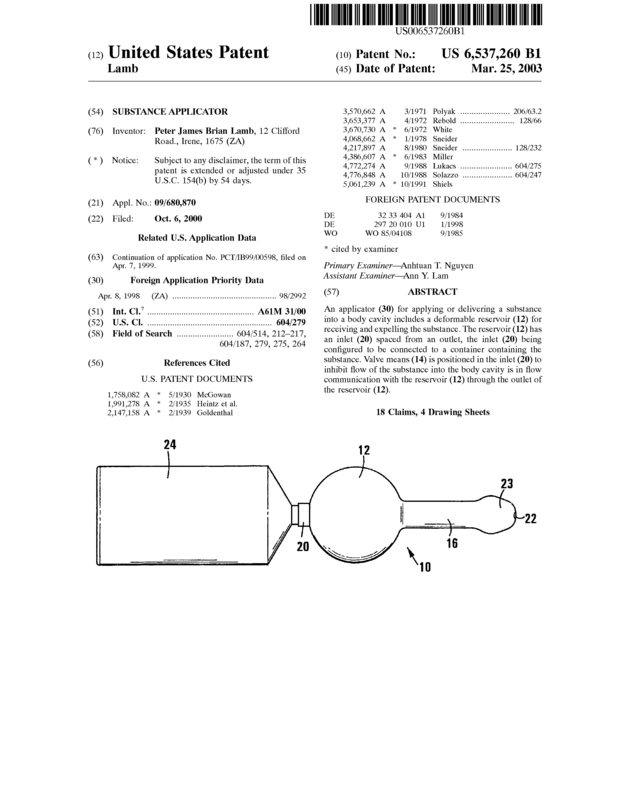 US 7,172,573 B1 a patent for a vaginal tablet applicator, and US 7,815,593 B2 a patent for a device to easily, comfortably and hygienically insert vaginal tampons, are also available for sale, or to be licensed. Page created at 2019-04-23 6:20:24, Patent Auction Time.